Convert interest rates from one period length to another. Convert between yearly, half yearly, quarterly, monthly, fortnightly, weekly and daily rates. Converting compound interest rates from one period length to another is not as easy as one may think e.g. converting from a yearly interest rate to a monthly interest rate is not as simple as dividing between 12. This is because no interest would be calculated on the interest earned in previous months i.e. interest is not correctly compounded. This is clearly not correct as 6.83 too much interest has been calculated. 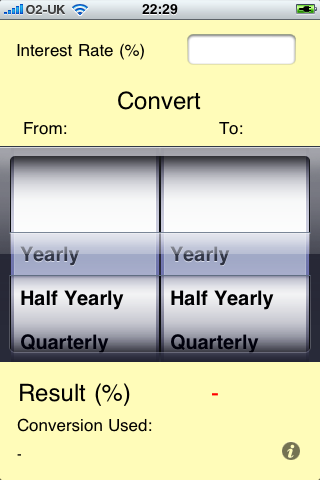 The same calculation using a monthly rate of 0.94888% calculated by this app gives a correct closing balance of 1,120. This app quickly and easily calculates the interest rate you need.